I picked this one up back in February at one of Audible's 2-for-1 sales. I needed a book set in a bookstore or library for one of my reading challenges, and this one fit the bill. What a little gem! The main character is Trisha Miles, who has recently divorced and decided to fulfill her lifelong dream of owning her own bookstore. She moved from Manhattan to a little place called Stoneham, New Hampshire whose economy is booming thanks to the tourist draw to their antiquarian and specialty bookshops. Trisha's shop called Haven't Got a Clue (love that name!) specializes in vintage and first edition mysteries, and she's the village's newest bookseller. She lives in the loft above the bookstore with her cat, Miss Marple. Doris owns the shop next to Trisha, and she's a bit pushy and brusque. She's not happy with the terms of her new lease, and she wants all the booksellers to stand united against their mutual owner to renegotiate. 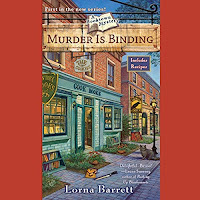 When Doris is murdered and her most recently acquired rare and valuable cookbook is found on Trisha's bookshelves, the finger points to Tricia who has to solve the mystery to clear her name. I really liked Trisha! I admire her strength and tenacity. She isn't so crazy when her sister, Angelica, calls her up and tells her that she is coming for a visit but I loved Angelica as a sidekick. The two sisters hadn't been close in the past, but this is a new start for both of them. Angelica seems to take joy in taking care of Trisha, cooking up delicious meals for her. I think they make a great crime-solving duo! This audiobook is narrated by Cassandra Campbell, who I've heard many times before. Everything about her is wonderful, from her pace to her inflections. I am so impressed with this first book in the series that I have asked my library to purchase the entire series in audio on Overdrive. There are currently 11 books published, with the 12th to be published this year. Fingers crossed that they fulfill my request! I am looking forward to listening to the next book in the series, Bookmarked for Death. 4 stars!! 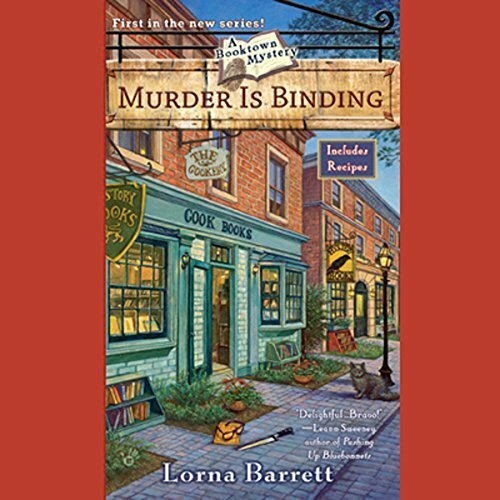 It was really good, and you should put it on your TBR if you enjoy cozy mysteries! Ok this sounds good from the heroine to the narrator! I will cross my fingers that the library orders them! I am going to look this one up on audio!